Robotic science is becoming more and more a part of our everyday lives. This amazing kit will allow young explorers to understand how robotic servos and relays operate as they build a functional robotic arm of their own. 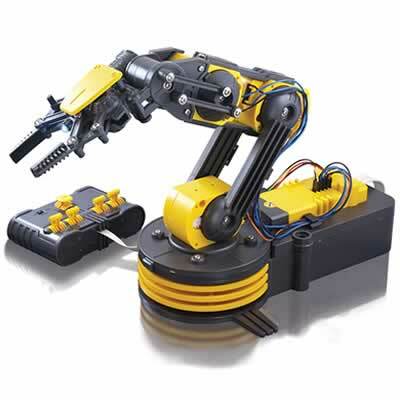 Once complete, the robotic arm can be used for assisting action figures, creating robot art, or whatever a young imagination can come up with. It uses 5 axes of motion and includes a gripper with a searchlight for use at night. This is a robot kit and construction time is about 2 hours. For ages 10 and up. This is an amassing product to help children understand how technology works.